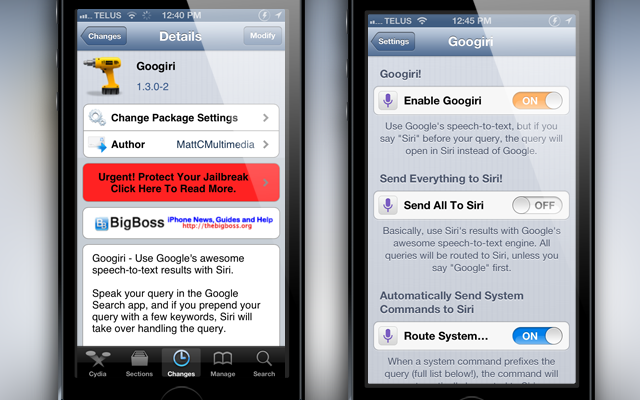 A new Cydia tweak called Googiri aims to bridge the Google Voice Search and Siri functionality on a Jailbroken device to make one virtual assistant to rule them all. The two dominant platforms are currently run by Apple and Google, and each have their strengths and weaknesses, and unfortunately it is a case of compromise in most cases when choosing one. The ideal solution is to have both iOS and Android in your tech arsenal for that balanced experience. It’s for this reason that a tweak like Googiri is so valuable in the tech world. Google Nowhas an unparalleled search functionality and integration with the Google search App, but there’s just some things it can’t do like hook into the native iOS Apps. Likewise, Siri is a class of her/his own, but does some functionality Google Now offers. Googiri aims at changing that by bridging the functionality gap between the two voice assistants. The way this works is by appending the word ‘Siri’ to any query to have Siri take over in the response. Or, if you select, you simply say ‘Google’ in the phrase to route the query in that direction. However, when you say functions that would normally only be handled by Siri, such as “Remind me about…” then Siri will automatically take over. It is only where both services can handle the request (such as the weather) that you have to specify which service to use, unless you’d like the default. You’ll need to download the Google Search App, available free in the App Store, for this tweak to work correctly, but simply search Cydia for Googiri and install it to finally bridge the gap between Apple and Google’s personal assistant voice recognition technologies. Let us know what you think of Googiri in the comments section below and if which personal assistant service you’ve found yourself using more since installing the tweak.